Once again I am falling behind but I have a box of 58 cards ready to get mailed tomorrow and needed two more any hero cards so I thought I would use the previous two sketch challenges. And here is my card. 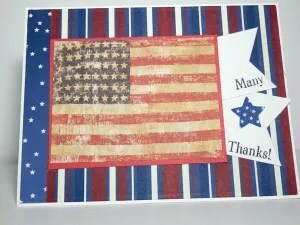 I used holographic paper adhered to cardstock for the larger layer and then cut out the stars from scrap paper. 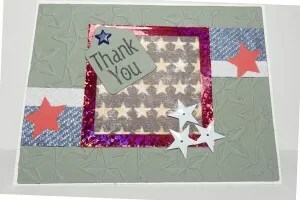 Used embossing folder for the stars – went with a grey card base because of the distressed background of the star paper. I really like the background embossing on your sketch card! Two great cards for the challenges! I never could come up with an idea for last week’s sketch, but I love what you’ve done with it – and this week’s sketch too! Just look at all that sparkle!